I have made a point of tracking my dividend income for over the past 2 years. Hopefully it will inspire some others like it does for me to start building their dividend income portfolio. I know that tracking and reporting my results helps to motivate me. My results provide a visual reminder of the progress that I am making every month. After following several other personal finance sites, I have decided to follow suit and start tracking my family’s net worth as well. To be honest, net worth is something that I never really cared too much about. A few of the metrics used to calculate it are not actual numbers, but rather estimates like home value. That is why in the past I never really put too much “stock” into our net worth. Over the past several weeks, I have changed my mind (a little) on reporting net worth. While I won’t report out every month, I think it can provide more motivation for me (and hopefully others) to focus not just on my dividend investments. While my dividend income investments are tracked in my net worth, there are several other factors taken into consideration like real estate and other assets and liabilities. I plan to start here in March and report back every 4 to 6 months on our status. Another reason helping me decide to track our net worth is the power of using the Personal Capital application. It is a great (free) tool for those of you who have never used it. I highly recommend it! 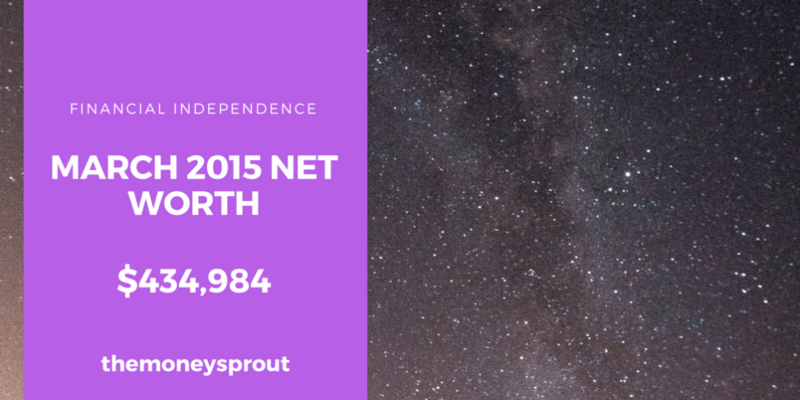 As of March 1st, 2015, our net worth was $434,983.82! While certain assets like our mortgage are an estimate, it is neat to see that my wife and I have a modest net worth. We certainly want to continue to grow our worth, but we are happy where we stand right now. I am not going to break down each of our assets and liabilities line by line – at least for now. Instead, I want to give a high level overview of our main asset and liability groups. In the future, we can compare our overall net worth from past reports, along with various asset and liability categories. We currently have 3 main asset categories that I am reporting on, which include investments, cash, and home value. I am sure there are some others (ie – car value) that have been forgotten and will be added at a later date. This category includes our dividend income portfolio, 529 plans for the kids, emergency fund accounts, retirement accounts, etc. It is currently are highest valued asset and we plan to continue growing it. Our current cash includes all of our checking and savings accounts. I expect this category to grow slowly overtime, but not as much as our investment accounts. The plan is to move money from cash into more investments to maximize our return on investment. This is where the numbers get a little tricky figuring out. We are currently using the Zillow estimate on our home, which is calculated directly through Personal Capital. This asset will likely be the most volatile over time and have the biggest impact on our short term net worth reports. For this reason, I don’t plan on calculating net worth every month. I have already realized that I didn’t include the value on our family mini van. Future reports will include this asset and maybe a few others that I have forgotten about. Wouldn’t it be awesome to only have to report on our assets? Unfortunately, that is not the case and we do have several liabilities that need to be paid off. We will start with the largest liability, which is our mortgage. My wife and I have no desire to rent and have owned our current house for about 7 years. We have paid off a decent amount of the loan, but still have 20+ years to go. I have started looking at possible refinance options to reduce the remaining years of the mortgage, but have not found any rates that work for us at this time. Yes, my family does have a auto loan on our family vehicle. We are paying less than 1.0% interest on the loan because of our outstanding credit. We do have a second vehicle (my car) that has been paid off for a long time. The car is old but still runs well and gets good gas mileage. I have realized that we need to include our estimate value on our family car as an asset. That will be added in our next net worth update. I am not sure if our second car is even worth reporting. We have two primary credit cards that we use to pay our bills. Over 90% of our purchases and monthly bills are paid through one of our credit cards. We do this to earn credit card rewards and pay off the balance of our cards each month. This liability category will certainly vary from month to month. Depending on when we report our net worth will help determine how large or small this liability will be. I am sure there will be some tweaks along the way when it comes to reporting our net worth. For example, we have already realized that our family car needs to be added as an asset. This should increase our net worth by several thousand dollars. While I am not going to report our net worth every month, I do think it is a good idea to review it periodically. Looking at my assets and liabilities helped my wife and I understand our financial situation a little better. It also is a big motivator for me to look at our net worth and set realistic goals to increase it. Do you report on your net worth?